If It's Hip, It's Here (Archives): It's Fast. It's Furious. It's Earth Friendly. The New Mission One EV Sport Bike. It's Fast. It's Furious. It's Earth Friendly. The New Mission One EV Sport Bike. 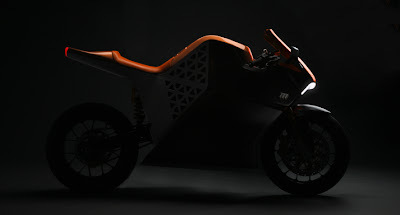 This past Wednesday, Feb 4th, Mission One's EV Sport Bike, the world's fastest electric motorcycle, designed in conjunction with Yves Behar and his Fuse Project, was unveiled at the TED 2009 Conference. It's mean, it's green and I wish I had the 70k to buy one. Forrest North of Mission Motors and his two co-founders, Edward West and Mason Cabot, have assembled a real dream team with incredible depth and experience and whose resumés list companies like Tesla Motors, Ducati and Google. The first 50 bikes produced will be a special Limited Edition model delivered in 2010 with a $68,995 price tag, while a standard, more affordable Mission One model will be announced this summer. 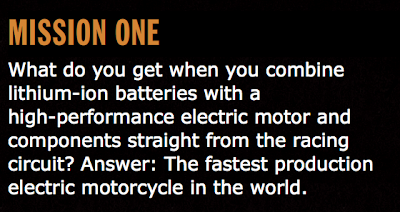 Mission motorcycles use the most energy dense lithium-ion batteries available on the market. That makes them different from most other electric vehicle companies. Most vehicle manufacturers opt for lower energy cells that are simpler to manage, but result in vehicles with limited performance and limited range. The high-energy lithium-ion cells in a Mission Motorcycle get the 150 miles of range that riders expect when on a sport bike. And their patented battery cooling and management technologies allow the bikes to safely draw more power from these cells, giving them the acceleration of a race bike. Mission motorcycles' induction motor provides over 100 foot-pounds of torque. Unlike an engine, however, the torque curve on their electric is completely flat. The rider feels 100 foot-pounds of torque at a standstill, at 60 mph, and everywhere in between. Gasoline motorcycle require multiple gears in order to provide power at different speeds. The torque curve on our electric motor means that a Mission motorcycle can achieve gasoline sport bike performance with no gears. And all that power comes in a package about the size of a soccer ball. On a Mission Motorcycle, the on board computer does more than run the bike. It comes fully equipped with data acquisition system and wireless communication capabilities. On a Mission Motorcycle, riders can capture ride data in real time and wirelessly download that data to a computer to share with friends. Gone are the days of tuning your engine with a wrench, you tune your ride in minutes with your laptop computer. We have complimented our groundbreaking powertrain with the best components money can buy. The Mission One is a superbike in all aspects of the word. The 2010 model comes equipped with: Ohlins inverted front forks, 43mm TiN coated tubes, Ohlins fully adjustable shock, Brembo 4 piston monobloc calipers, Marchesini wheels, and race compound tires. The Mission One's onboard charger allows riders to recharge from any standard wall socket. Recharging from empty to full takes 2.5 hours off of a 220V outlet (8 hours off of a 110V). In California, which has the 11th highest electricity prices in the US, "filling up" your bike only costs you $1.96. The Mission One's data acquisition feature allows riders to capture ride data in real time. Riders can record ride data, such as speed, location, or lean angle; or bike data, such as motor current, battery voltage, or efficiency. Riders can take that data to their computer to analyze their performance, brag to other riders, or prepare for their next ride. Front Brakes Brembo forged 4 piston calipers. 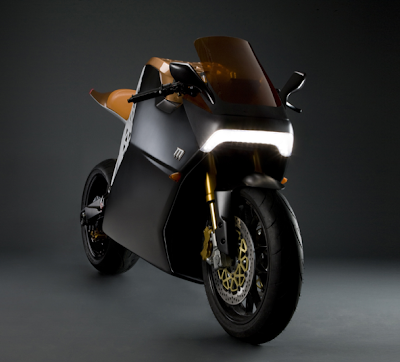 LONG BEACH, CA - February 4, 2009 –Today, Mission Motors unveils a revolutionary vehicle, the Mission One, the world's fastest production all-electric motorcycle, at TED2009. Mission Motors CEO, Forrest North, along with lead designer Yves Béhar, founder of fuseproject, will present the vehicle in development onstage to the TED audience on February 4. Mission Motors will exhibit the vehicle throughout the conference at the Kohler LivingHome at the Long Beach Performing Arts Center, and will be on hand to discuss the company's vision for a radically new brand of motorcycles. The company will also provide attendees the opportunity to see inside the product development process through the installation of a motorcycle design studio inside the Kohler LivingHome. "The Great Unveiling," the TED2009 theme, makes a fitting platform for the launch of Mission Motors' first vehicle, the Mission One. 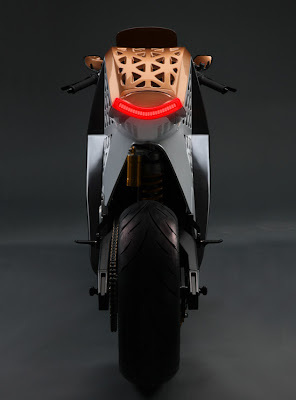 It is the first production electric sportbike that features uncompromised performance and an iconic new design created by world-renowned designers Yves Béhar and fuseproject. With a top speed of 150 MPH and an estimated range of 150 miles, the Mission One rivals gasoline sportbikes while dwarfing the performance of any other electric motorcycle on the market. The electric drivetrain creates a riding experience unlike anything currently available on a production vehicle. The electric motor's linear torque curve provides peak torque at zero rpm, a feature gasoline engines cannot match. The motor delivers faster acceleration than most gasoline sportbikes without ever having to shift gears. 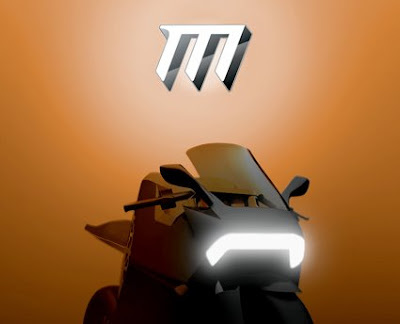 The announcement formally debuts Mission Motors, a San Francisco-based company geared to redefine the world of performance motorcycles, which was founded in 2007 by entrepreneurs Forrest North (CEO), Edward West (President), and Mason Cabot (VP of Engineering). 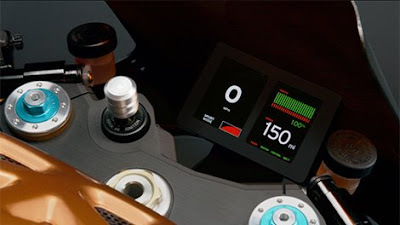 Building on their backgrounds in engineering, a desire to develop clean vehicles, and a passion for motorcycles, the Mission Motors founders developed a proprietary high energy lithium ion battery pack that could provide both the range and acceleration needed for a high performance sportbike. The company (named Hum Cycles at the time) placed second in the transportation category of the 2007 California Cleantech Open, the largest cleantech business plan competition on the West Coast. "As a motorcycle enthusiast and engineer I knew I could combine my passion for motorcycles with my passion for innovation and create a motorcycle that truly sets a new standard in the perception of electric vehicles," said Forrest North, Founder and CEO, Mission Motors. "With the Mission One, we're writing the next chapter in motorcycle design, delivering a new riding experience without sacrificing performance or design in a zero emissions vehicle." 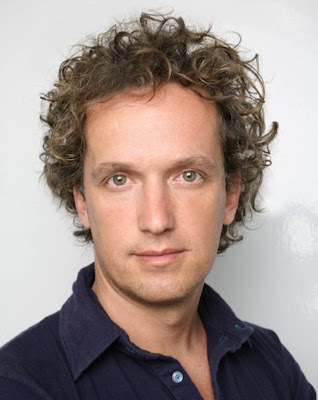 With core engineering underway and an attractive business model, North and his co-founders turned to Yves Béhar's fuseproject to create Mission's unique brand and creative direction, as well as an iconic industrial design for the first product. 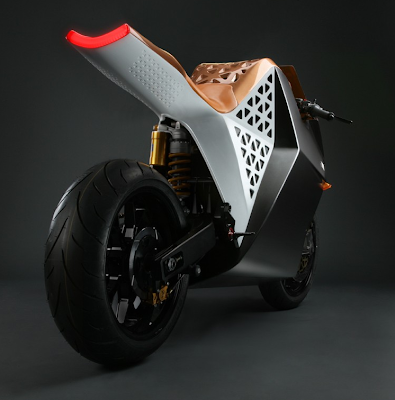 The engineering team at Mission Motors and the design team at fuseproject worked in close collaboration to design the Mission One from the ground up, creating a machine that makes a bold statement about performance, technology, sustainability and design. "This project was a dream come true: a statement about how design can make performance and sustainability come together without compromise," said Yves Béhar. "I believe Mission is an icon for a new era of efficient and exciting vehicles. Designed to express speed and efficiency in it's overall sharp lines, the Mission bike is also highly detailed with special attention to a riders needs, bringing a high level of product design and ergonomics to a new generation of performance transportation." 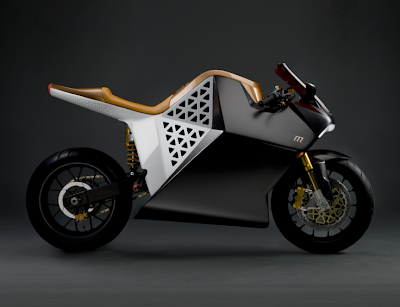 Mission Motors is building the fastest production electric motorcycle in the world. Headquartered in San Francisco, California, the company combines innovative technology, iconic design, and superb performance with the freedom of a zero emissions riding experience. Mission's elite team of engineers is creating the first motorcycle company built on the innovative spirit of the Silicon Valley. The concept is simple: Redefine the world of performance motorcycles. For more information on Mission Motors, visit www.ridemission.com. special thanks to Mission Motors, Autoblog Green and Yves Behar for info and images. The fact that you, of all people, enjoy my blog is the highest compliment! Thanks so very much.